Error 8645: A time out occurred while waiting for memory resources to execute the query. Re-run the query. Even though the query uses 0 KB of memeory it still might time out depending on other activity on the server. Why does SQL Server request so much memory? What can I do about it? Creating a columnstore index is by default a parallel operation unless memory is constrained. Creating the index in parallel requires more memory than creating the index serially. When there is ample memory, creating a columnstore index takes on the order of 1.5 times as long as building a B-tree on the same columns. The memory required for creating a columnstore index depends on the number of columns, the number of string columns, the degree of parallelism (DOP), and the characteristics of the data. For example, if your table has fewer than one million rows, SQL Server will use only one thread to create the columnstore index. With 0 rows the DOP is downgraded to 1, but otherwise the number of rows doesn't appear to matter for the memory grant. This is undoubtedbly a gross oversimplification, but perhaps SQL Server builds the CCI one rowgroup at a time per DOP and maintains the string dictionaries as it goes along. That sounds fine in practice and means that the memory grant won't scale with the number of rows in the table, but without a check for a very low number of rows SQL Server could request an excessive memory grant. The excessive memory grant wouldn't matter in most cases because the CREATE INDEX is so fast, but it can matter if SQL Server waits on the memory grant. Applies to: SQL Server 2014 through SQL Server 2016 and Azure SQL Database. Specifies to store the entire table in columnar format with a clustered columnstore index. This always includes all columns in the table. The data is not sorted in alphabetical or numeric order since the rows are organized to gain columnstore compression benefits. 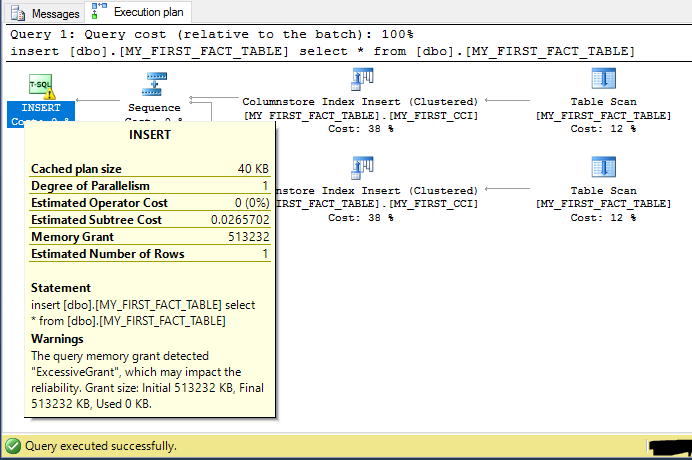 A CREATE TABLE statement does not generate an actual plan so I can't immediately tell if this reduced the memory grant. I tried creating the table 1000 times while hammering the sys.dm_exec_query_memory_grants DMV but never got any results. That suggests that memory was not granted but isn't proof. I also tried extended events with query_memory_grant_usage and didn't get any results for the single CREATE TABLE statement. Of course, the best way to test is to create the CCI the original workflow conditions with limited available memory. I did that and did not experience any memory timeouts. I suppose it could be said that defining the CCI in the CREATE TABLE statement for a new table is a best practice. However, if your workload causes this error then changing the CREATE TABLE script probably isn't sufficient to address other problems that you'll run into, such as memory issues when you starting loading data into the CCIs. Not the answer you're looking for? Browse other questions tagged sql-server sql-server-2016 columnstore memory-grant or ask your own question.